Windham and Saco. From retirement planning to tax preparation, the company and its owner Jonathan D. Stewart can set a family or individual on the path to financial success. Started in 1989, J.D. 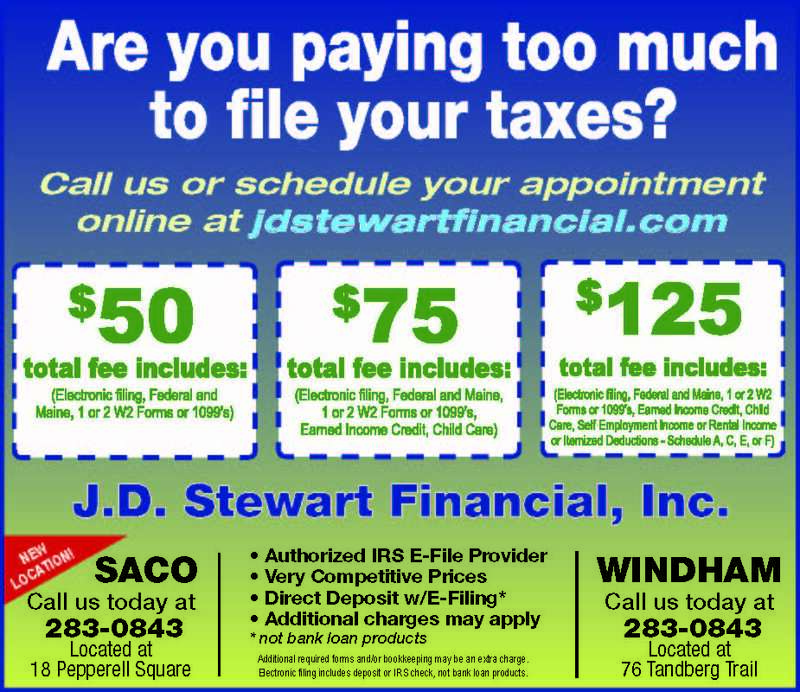 Stewart Financial has a primary office in Saco, and a satellite office in Windham at 76 Tandberg Trail. JD Stewart Financial is independent, so they are not tied to any one product or company, allowing them to work in the client’s best interest. They take the time to learn about the client’s specific needs and then tailor the best possible program for them. With the experience and education the financial advisors have, they can educate the client and work to meet their financial goals. “Tax preparation and retirement planning are the biggest parts of my business,” Stewart said. He works with clients from age 18 to age 100, depending on their needs. Those in the 18 to 25 age bracket can receive help getting their finances in order for the future. In the middle aged group, Stewart can review and design retirement plans, prepare taxes, and set up college savings accounts. For those retired, he can help plan retirement income strategies, prepare taxes, and assist with wealth transfer. It doesn’t matter whether the client is low income or high income, J.D. Stewart Financial can help them meet financial goals. For as little as $100, clients can start a portfolio or meet with an advisor to assess where they are financially, and what they should be doing. There is no charge for a financial review, and in 30 to 45 minutes, a client can learn what areas need to be addressed. For those who already have a financial planner, J.D. Stewart Financial can provide a free, second opinion for retirement or financial planning. “There are new strategies available now that were not available five years ago,” Stewart said. Stewart has a skilled team of employees, who all have their own specialties, but are also available to help with other services. Christina T. Totos is the executive assistant for the Saco office. 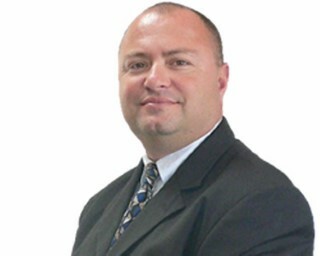 Greg Blackburn is a CPA, registered tax preparer, and licensed insurance agent. It is tax season, and J.D. Stewart Financial can professionally prepare your tax return. They know what to look for, can find deductions, and use their experience to the client’s advantage. On the J.D. Stewart Financial website there is a tax organizer and reminder checklist that anyone can use to prepare for their tax preparation. The biggest mistakes people make when it comes to financial planning is “not starting early enough for retirement and getting into too much debt. I can help with both things,” said Stewart. When it comes to debt, the financial advisors can offer ideas and educate client on spending habits so they don’t get into that situation again. Financial advisors with J.D. Stewart Financial have ongoing education for income taxes, which they’ve been doing since 1992, along with other training and licensing classes. Check out all of their services online at jdstewartfinancial.com. Appointments are recommended at both offices, especially during tax season. For more information about the company, visit www.jdstewartfinancial.com. To contact them, the best way is by email at info@jdstewartfinancial.com or call Monday through Friday 9 a.m. to 5 p.m. at 207-894-5523. Appointments can be scheduled online.